The date the 8th of March. The location was Brisbane, Australia. The speaker on the podium was the then prime minister Bob Hawke, delivering a passionate speech to not only his party colleagues and the press but to all Australians who cared to listen. In this national task of mobilising our human resources, our scientists and researchers stand at the forefront. Australia must reduce its reliance on imported technology and borrowed research. We must become a leader in the production and export of ideas. It was a passionate speech and one that certainly aroused my excitement as a young research and development engineer all those many moons ago. Hawke was without a doubt correct in his bold vision for Australia. If we are to become a strong nation, then we must be a nation that produces and exports “ideas”. Without the generation of new ideas, new products and new services generated by research and development, an economy’s future is essentially dead in the water. The above list should highlight an interesting omission and it is one that has existed for a long time in Australia’s budgets. You may have noticed that there is essentially no Research and Development aspect to our country’s spending. But if you look further, buried deep into the budget breakdown is a figure of “General research” that is tagged at..wait for it…$2.9B. Yes, that is less than 1%. By virtue of our spending, this does not make a “clever country” in any way shape or form. It seems that in Australia, the relevance for Research and Development and ideas generation as an economic stimulator, has taken a long and slow slide for the worse. Australia has regrettably had a successive number of pusillanimous governments who have failed to champion this cause. As guide to how important Research and Development actually is, comes from the US Council of Economic Advisers. They concluded that half of all the growth in the US economy in the last forty years “has been due to investments in research and development”. So why the 90’s economic and political background history lecture today? And what is the relevance to the topic of our discussion ? The “join” came from an article that caught my eye online today, that is the Artificial Intelligence (AI) job market in Australia. I believe that AI is currently one of the hottest areas of IT that can provide positive economic potential for all countries, organisations and individuals that are able to service the needs of this rapidly growing market. 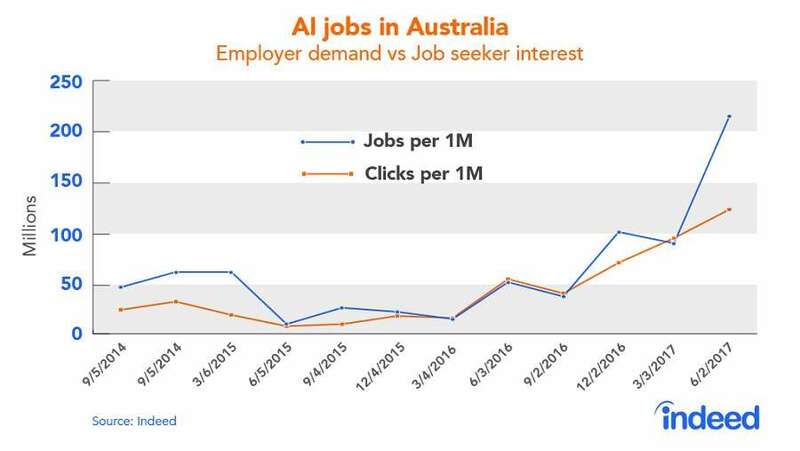 So how fast are AI jobs growing in Australia you ask? Over the last 12 months the number of AI roles in Australia has increased by 306%, according to Indeed. It seems that to generate synthetic human reasoning (to eliminate human interaction) we need to have a lot of clever humans invested in the process of creating it! But what has not grown at the same rate are the number of people enabled with the requisite skills to participate in this process of AI creation. We just don’t seem to have the right number of people with the skills needed to fulfill the demands from the market for AI services. This skills gap, in my opinion will continue to widen indefinitely unless something is done. Indeed’s data reveals that there are almost twice as many AI jobs available as there are suitable applicants, with a ratio of 1.73 roles available per candidates searching in the last quarter. Interest in AI type roles has risen by 463% in the past two years, but this is still way short of meeting the never ending and ever increasing demand. And it is a demand that we need to meet, if we are to succeed in being a “clever country”. Just how important is it for us to meet that AI challenge ? Research from Accenture on the role of AI, shows that if Australian businesses were to leverage AI’s capabilities, there would be a $400 billion increase in GDP by 2035, increasing Australia’s annual economic growth rate from 2.2% to 3.7%. “Successful AI scaling will almost halve the time it takes for the Australian economy to double in size, it’s a huge boost by any measure. However, it’s notable that Australia lags many of the world’s other leading economies in scaling the emerging technologies essential to AI adoption”. Sobering points for sure, but the question begs to be asked. Are we up to this challenge ? Can Australia really be competitive in the AI space? Personally, I am hopeful that we can be a force in the global AI economy. Despite what many may think, Australia produces more than 2% of the papers in the world’s most influential scientific journals. Figures from a Bureau of Industry Economics report on Australian science suggested that our science is disproportionately influential, as measured by level of reference to Australian research findings by other scientists. So we are indeed a “clever country” after all, but if we are to be a successful clever country we will need our present and future governments to seriously support our Engineering, ICT and Science industries. With financial support we can build the right pool of advanced skills from which we can build the right products and services to catch a ride on the wave of the global AI juggernaut. But if we continue on the current trajectory of not investing in new skills, new ideas and innovative technologies we may indeed be left behind. I am quite sure that this was not the outcome Bob Hawke had in mind for Australia as he ascended the speaker’s podium to deliver his visionary speech 27 years ago.